There we were this morning, heading along the A12 back towards home from the ferry port at Harwich. The ferry from the Hook of Holland had docked at 6.30am and after a brief wait for the local Morrisons petrol station to open and sell us some breakfast we’d assumed we’d just drive straight back and be home by 9. Our plan was a quick nap before cracking on with everything on our to do list. Plans changed somewhat when we spotted a car boot sale in a large field just to the side of the dual carriageway. We turned round at the next roundabout and quickly found a cashpoint to make sure we didn’t try and pay for anything with Euros, before heading back. And I’m so glad we did. It’s ages since I’ve been to a good car boot sale. And amazingly this was also our first one together. Round where we live they always seem to be very overpriced, and to be honest the last couple I’ve gone home pretty much empty handed. This one was very very different though! Well worth the £1 entry fee. We’d done no planning at all as to what we were looking for, so it really was all down to what we spotted and what took our fancy. 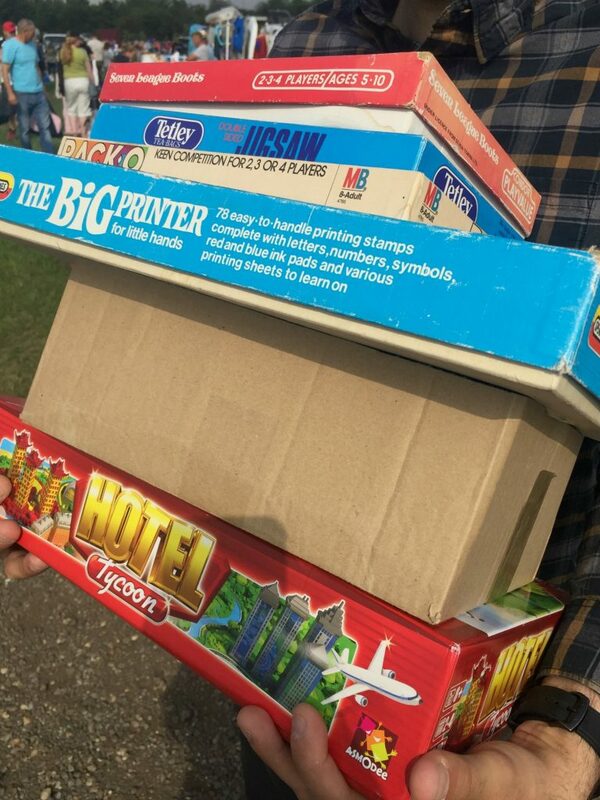 There was certainly proper car boot gold to be had though. Take a look at what we found. One of the most refreshing things was the prices. Ok, so there were some things that I walked away from as I thought they were charging far too much, but on the whole process were good. Certainly far better than they often are in Hertfordshire. Some of the vintage board games will probably be cropping up soon over on Penny Plays, so make sure you’re following us to see more of them. We’ve plans for some features, some reviews, and also some videos and podcasts around the games that we’ve been picking up. Certainly lots for any vintage board game fans out there.